Vårt Micro Fina Calciumsupplement är avsett för djur med låga Vit D3 krav, och för djur som utsätts för viss del solljus eller bra UVB lampor. INFORMATION: Our Calcium Carbonate is mined from the Mohave Desert in California, where it was deposited 300 million years ago during the Mississippian Age as a large graveyard of marine animals. It was formed in very favorable conditions in a shallow marine environment. These remains were cemented together with Calcium Carbonate precipitated out of the primordial sea. The deposit was then further purified and metamorphosed by various natural geologic processes including high pressure and temperature. This deposit is an extremely pure source of natural Calcium Carbonate which makes it a truly unique source for food, supplement, and pharmaceutical applications. It is FDA Food Grade Certified. Our calcium is micro ground to an average size of 3.5 microns, and is the finest available grind on the market, which provides the ultimate “stick” when dusted onto insects. INGREDIENTS: Calcium Carbonate, Vitamins (Vitamin D Supplement). GUARANTEED ANALYSIS: Calcium min. 30%, Calcium max. 32%, Vitamin D-3 10,000 IU/lb. DIRECTIONS: This product contains low levels of Vitamin D-3 and should be the product of choice for sensitive species, or species kept with moderate levels of UVB from occasional natural sunlight or UVB producing bulbs indoors. 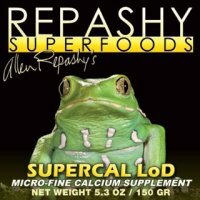 For most species, we recommend Repashy’s SuperCal MeD, and for therapeutic usage or for species with high D-3 requirements, we recommend Repashy’s SuperCal HyD. Dust insects using the “shake and bake” method before feeding to animals. For supplementing fresh fruit and vegetables, use 1 heaping Teaspoon per Pound. It is recommended that Repashy’s SuperVite vitamin supplement be used at a 1:1 ratio to this product to provide a balance of essential vitamins. For an “All-in-One” solution please try Repashy’s Calcium Plus.